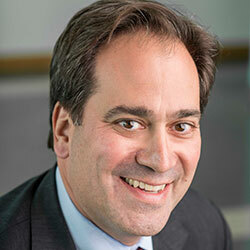 Northwestern University professor Chad A. Mirkin was recognized today (Feb. 11) with the prestigious 2016 Dan David Prize in the Future Time Dimension for his trail-blazing breakthroughs in nanoscience that hold great promise for improvement of our world. Mirkin, the George B. Rathmann Professor of Chemistry in the Weinberg College of Arts and Sciences at Northwestern, is a pioneer in a unique frontier. For the past two decades, he has been repackaging and chemically modifying DNA, the genetic blueprint of life, and its sister nucleic acid, RNA, in new forms and tacking them on to nanoparticles in a quest to achieve new breakthroughs, especially in the health sciences. His work has led to the invention of 3-D structures called spherical nucleic acids (SNAs) that have chemical and physical properties that are radically different from what is found in nature. SNAs are being used to develop extremely sensitive medical diagnostic systems that can, for example, locate cancer cells, concentrate stem cells within a specific area or study how new drugs affect the inner workings of cells. SNAs are also promising in the development of new therapies. They are non-toxic and can enter cells and flip genetic switches -- causing a cancer cell to die, for instance. Additionally, SNAs can cross barriers, like the skin or the blood-brain barrier, opening the door for the development of many new treatments for diseases such as melanoma, glioblastoma multiforme (a type of brain cancer) and Alzheimer’s and Parkinson’s diseases. Because of these unusual structure-dependent properties, SNAs have the potential to positively impact tens of millions of people who suffer from diseases with known genetic links. Mirkin shares the $1 million prize with Paul Alivisatos, University of California, Berkeley and Lawrence Berkeley National Laboratory, and Sir John Pendry, Imperial College London. All of the 2016 Dan David Prize laureates will be honored at an award ceremony May 22 at Tel Aviv University. The international Dan David Prize, headquartered at Tel Aviv University, annually awards three $1 million prizes for outstanding achievements in the three time dimensions -- past, present and future. This year, the future time dimension prize recognizes innovative and interdisciplinary research that cuts across traditional boundaries and paradigms in nanoscience and nanotechnology. Dan David Prize laureates donate 10 percent of their prize money to graduate students in their respective fields, thereby contributing to the community and fostering a new generation of scholars. Mirkin is the founding director of the International Institute for Nanotechnology (IIN). He also is a professor of medicine at Northwestern University Feinberg School of Medicine and professor of chemical and biological engineering, biomedical engineering and materials science and engineering in the McCormick School of Engineering and Applied Science. The IIN currently represents more than $800 million in nanotechnology research, educational programs and supporting infrastructure. The work reaches into virtually every industry, including health, energy, electronics, security and defense, and the environment. In addition to spherical nucleic acids, Mirkin also is the inventor and chief developer of three pioneering nanoscale fabrication and analytical tools: Dip-Pen Nanolithography, Polymer Pen Lithography and Beam-Pen Lithography. He is the founder of three companies, Nanosphere, AuraSense and Exicure, all aimed at transitioning advances in nanotechnology to the diagnosis and treatment of disease. The world’s top-cited researcher in nanomedicine and one of the most widely cited chemists, Mirkin has been a member of President Barack Obama’s President’s Council of Advisors on Science and Technology since 2009. He is one of very few scientists, engineers and medical doctors to be elected to all three branches of the U.S. National Academies -- the National Academy of Sciences, the National Academy of Engineering and the National Academy of Medicine. Mirkin’s contributions have been recognized with more than 100 national and international awards, including the NIH Director’s Pioneer Award, the Feynman Prize in Nanotechnology, the $500,000 Lemelson-MIT Prize and the 2015 inaugural $400,000 Raymond and Beverly Sackler Prize in Convergence Research.